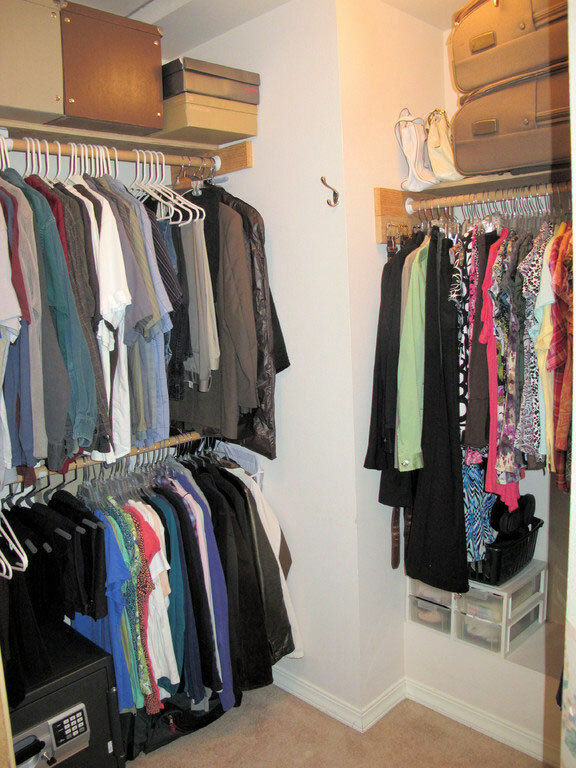 My Not-So-Perfectly Organized Closet - Spaces Streamlined Home Staging, Styling and Organizing Gig Harbor, Tacoma and surrounding areas. Number one is to not overbuy! At the beginning of each season I take some time to go through my clothes, get rid of those I no longer wear and then think about what is missing or needs replacing. I then only buy those items that I need to fill in the blanks in my wardrobe. Here is a picture of my closet after my late-spring shopping trip. A few new staple pieces hang on a handy hook while I take a little time to straighten and organize the closet. Since I do this seasonally the closet never has a chance to get completely out of control. Here’s my closet after spending an hour or so neatening it up and incorporating my new purchases. I feel so much better once this is done and excited to put some summer outfits together. 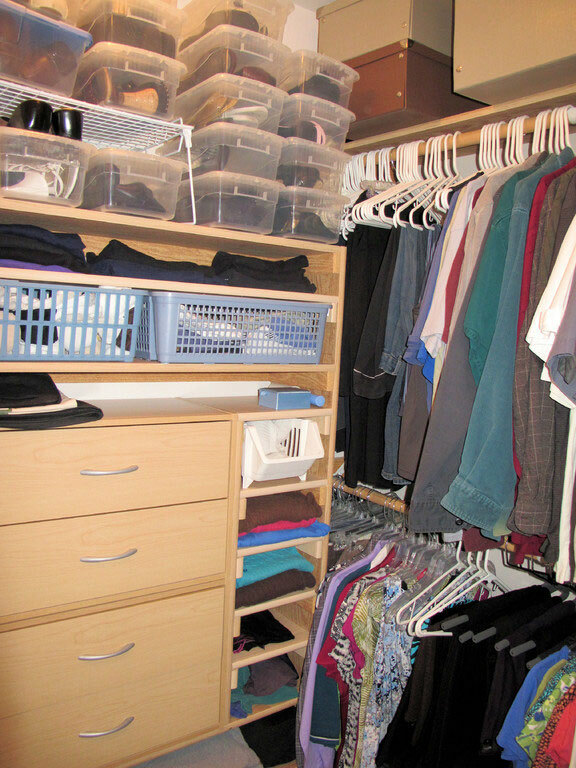 Storage boxes are kept on the top shelf to rotate a few seasonal clothes. Seasons here in the northwest overlap quite a bit so I only rotate the definite winter and summer clothes such as heavy wool sweaters and beachwear. Then on the far right is my sleep and lounge wear. These are here because this happens to be the only place for long hanging items in my closet. I keep my dress shoes in plastic storage boxes to keep them from getting dusty. I use wall hooks to hold clothes that need attention (ironing, mending, return to the store, etc) in my sight so that I won’t forget to take care of them. A clothes basket is kept here to transport clothes back and forth to the laundry room. A sturdy chair is handy for sitting on for putting on socks, setting the clothes basket on while I put the clean clothes away and to stand on (very carefully!) when I need to reach the top shelves. 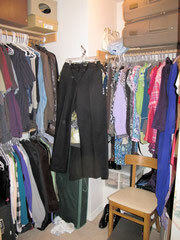 Hope you enjoyed peeking inside my closet- maybe some of my strategies will make yours work better for you. Happy Organizing!